January 6, 1985 Kodiak resident Rick Phillips from the George W was lost near Sitkalidak Island when the vessels skiff swamped. January 14, 1985 Jon Early of Kodiak was lost when the 34 foot K-Jo sank off Marmot Island. Two men from the K-Jo were rescued on January 16th. February 14, 1985 The 83 foot Alert went missing in the Shelikof Straits with five souls aboard. She was last seen heading for shelter toward Bumble Bay making ice. Lost were captain Mel Wick, Sean Heaney, Ray Basel, Paul Rowe and Svernin Ben-Adalsteinson. March 7, 1985 One crewmember was lost overboard from the crab fishing vessel Ocean Bounty. Two weeks later the vessel flooded and sank south of Cape Saint Elias. May 16, 1985 The seiner Anna O grounded while towing the vessel Head and Tail. Both vessels sank in the surf. The operator of the Anna O was never found. May 20, 1985 Four people were rescued and Ben Cantu (39) was lost when the fishing vessel Kimberly sank 80 miles northwest of Dutch Harbor. July 6, 1985 An unnamed skiff was found adrift in Chignik Lagoon; two were lost. July 6, 1985 Four people were lost from an unnamed fiberglass skiff when the anchor snagged in choppy seas and the vessel capsized less than a mile west of Ninilchik in Cook Inlet. Bob Boutang was the only survivor. Lost were Forrest Boutang (9), Brett Boutang (14), Clark Girton (51) and Michael Blanch (58). July 16, 1985 One person was lost overboard off of the 65 foot Pandad. July 25, 1985 Five children and one adult were lost from the Kiyuklook family when their unnamed 18 foot skiff swamped off of Savoonga. 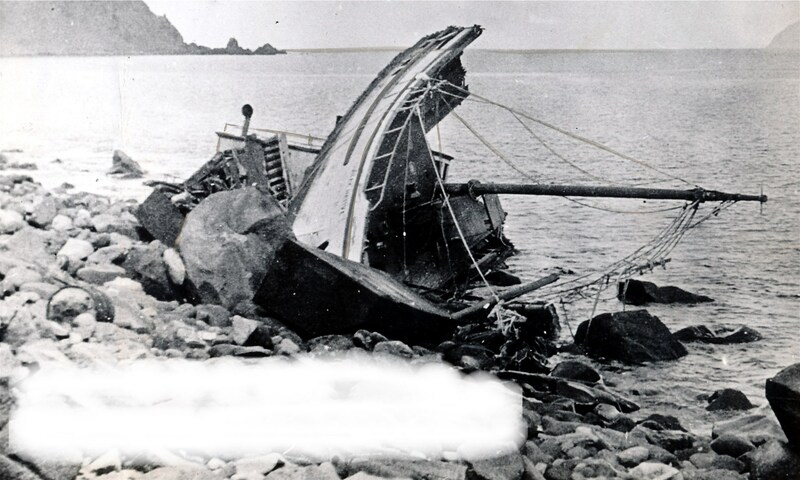 Two others drowned from a second 16 foot skiff attempting to rescue the Kiyuklook family. July 26, 1985 Two people tried to swim ashore from an unnamed skiff when their outboard ran out of gas on the northeast side of Shuyak Island. Only one survived. August 7, 1985 The 90 foot barge tender Sea Dancer sank 60 miles N of False Pass on the Alaska Peninsula with the loss of one person. August 7, 1985 One person was lost when an unnamed small boat capsized in heavy seas off of Glacier Island in Prince William Sound. August 20, 1985 Six people were lost when the 58 foot Western Sea sank somewhere NE of Kodiak Island. Parts of the vessel were found east of Long Island. Lost were captain Jerald Bouchard of Coupeville WA, Peter Barry of New Hampshire, Chris McLain of Idaho Falls ID, Steward Darling of Bremerton WA, Chris Hofer of Ft Collins CO and Bill Posey of Anchorage. September 2, 1985 Six people drowned when their 24 foot flat bottomed river boat collided with a bull moose on the Koyukuk River between Hughes and Allakaket. Arthur F. Ambrose (32), Carol Ann Ambrose (24), Ruth H. Beatus (27), Henry Beatus Jr. (26), Raymond Beatus (24) and Robert W. Nictune (22) were lost. September 6, 1985 Ken Kronk (28) was lost when the 70 foot steel tender Pacific Lady capsized and sank near Cape Spencer. Five other crewmembers were rescued by a U S Coast Guard helicopter. October 26, 1985 One person and one dog survived and two people and a dog were lost when a 12 foot unsinkable plastic skiff capsized between Ketchikan and Deep Bay to the north. Lost were Joe Walker, LeCrissa “Jinx” Walker and their dog Bandit. Thanks for the thoughts Charles. I don’t have a photo of the Alert in the files yet but am hunting for one through my contacts in Kodiak and on facebook. One person was lost when the 78 foot Pacific Lady rolled over in Icy Straits, 20 miles west of Cape Spencer. Warren: Icy Straits is EAST of Cape Spencer. West of C. Spencer is the Gulf of Alaska. Thanks JR..I made the correction. My information came from the Kodiak Harbormaster’s List which I am very grateful for. Do you know the name of the person lost? Ken Cronk was the crewmember who was lost. He had helped other crew get off of the sinking vessel but was disappeared when the vessel sank and was presumed to have gotten tangled in the rigging and pulled under. Never forgotten. Thanks Les. I will do what I can to make sure he is not forgotten. RIP Ken Cronk. Re: fishing vessel the alert that went down feb 14 1985. I have a photo of the alert that Charles was wanting. Captain mel wick is my uncle. Thanks Candyce. If you could email me at warren@alaskashipwreck.com we can figure out a way to share that picture of the Alert. I was the engineer on the Elizabeth F fishing with the Alert when they went missing. That tragedy is one of the reasons that I am posting this website. Mel and the rest of the crew are still missed by many. I worked on the Alert with Mel. I still think of Ray Basel who also went down on the Alert. Ray and I worked on another boat together. Memories of him will always be with me. 5-16-85 around 6 p.m. on a stormy Softuk bar, Bob Gill’s gillnetter “Heads & Tails” was found. He had left Cordova towing his gillnetter to the fishing grounds with his seine boat the Anna O. He would stay on his bigger boat the Anna O inbetween the fish openers. His friend Dean Curran from Cordova towed the found gillnetter to my tender the Heidi Sue. When the fish opener was over, I towed the gillnetter back to Cordova to his family. I am the cousin of Chris McLain who was lost on the Western Sea on 19 Aug 1985. I am trying to find any info./pictures of this boat etc. Any info. will be help. I do not have a picture but I will watch for one. The Western Sea was built in 1915 at Dockton, Washington and was originally named Saint John. In 1958 the vessel was owned by the Whiz Fish Products Company and became the Western Sea when Peter Pan Seafoods purchased it some time before 1965. She had a registered length of 52.0 feet, breadth of 14.1 feet and depth of 6.3 feet. Her tonnage was 32 Gross 22 Net, radio call sign WB2362 and official number 213251. The owner at the time of the loss was Jerald W. Bouchard who went down with the boat.